I love December months. I really think it is the most beautiful time of the year! Not only do we have wonderful weather in South Africa, but we are also celebrating the most important event, Christmas, in December. People, in general, are relaxed over December and therefore we tend to entertain more during this month. This sparkling wine jelly, white chocolate mousse and berry dessert is a great finish to any meal and celebration. 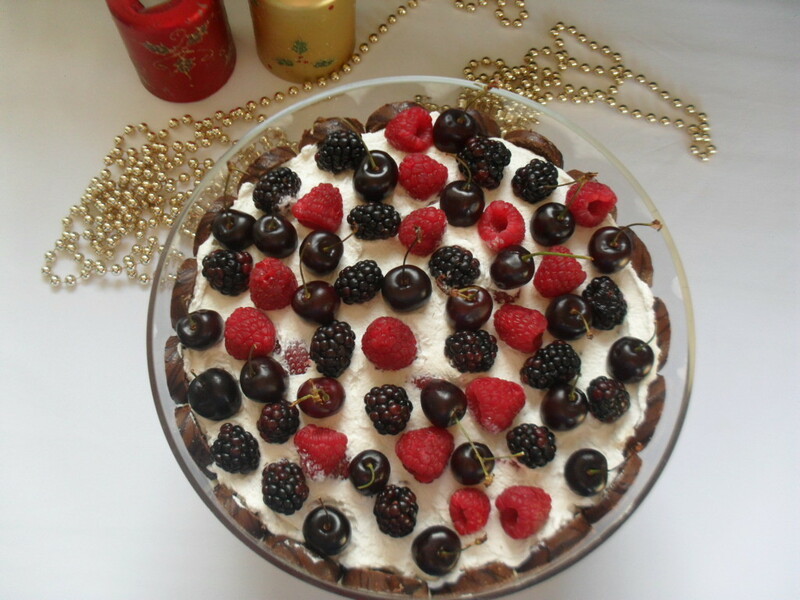 The dessert must be started a day or two before serving, since each layer must set before the next layer can be done. 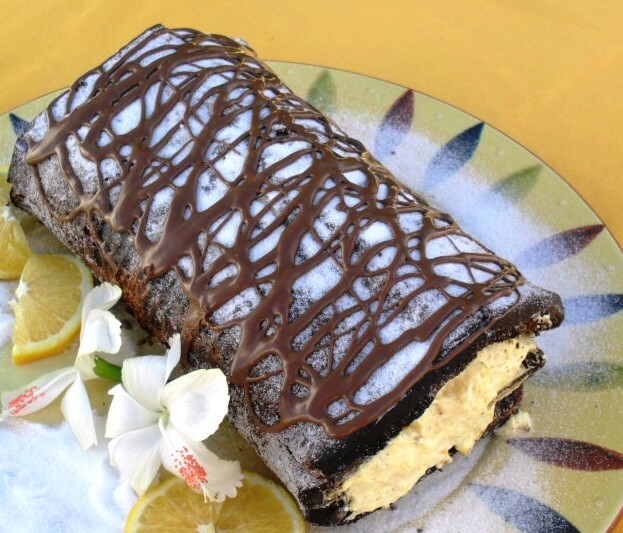 You definitely need some time to prepare this dessert, but it is so worth it! It is however not complicated to make. The end result is beautiful and delicious. 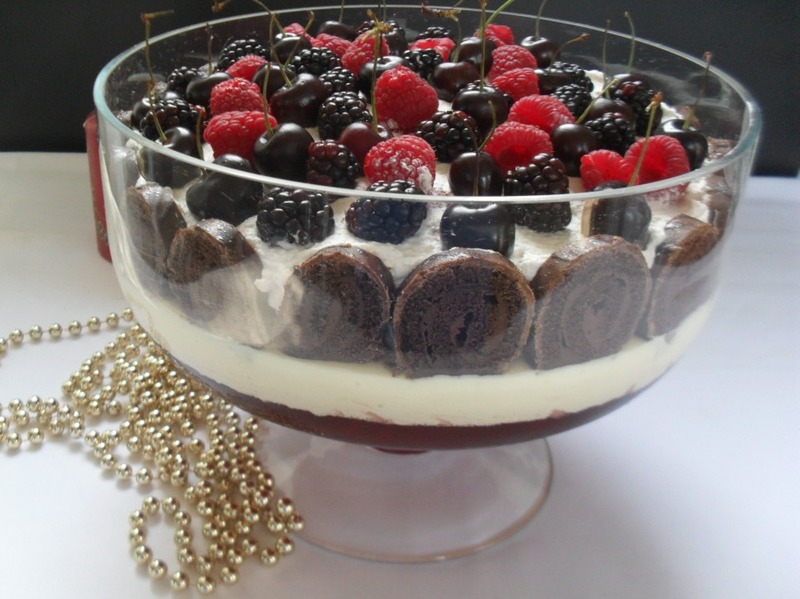 You will need a large glass bowl for the dessert. It makes about 20 servings, so the whole extended family can be entertained. Sprinkle the gelatine over the water in a small container; then dissolve over low heat. Stir until all the gelatine has dissolved taking care not to cook the mixture. Remove from the heat and stir the sugar into the gelatine mixture until it is dissolved. Stir the sparkling wine or juice into the mixture and pour the jelly into a large glass bowl. Refrigerate until the jelly is set; at least 6 hours or overnight. Beat the egg yolks and castor sugar until thick and creamy. Break the chocolate into pieces and melt over simmering water or in the microwave, taking care not to burn the chocolate. Add the chocolate to the egg mixture and mix thoroughly. Fold the stiffly beaten cream into the chocolate mixture. Beat the egg whites until stiff and add to the chocolate mixture. Place the boiling water into a small heat resistant bowl and sprinkle the gelatine over. Stir until all the gelatine has dissolved. Cool down for about 5 minutes and mix through the chocolate mixture. Spoon the white chocolate mousse on top of the set sparkling wine jelly. Return to the fridge for 3 to 4 hours. Place the sliced strawberries in a single layer on a large plate and sprinkle with the balsamic vinegar. Dust with the icing sugar. Leave for about 10 minutes. Whip the cream until soft and fold the strawberries and vanilla into the whipped cream. 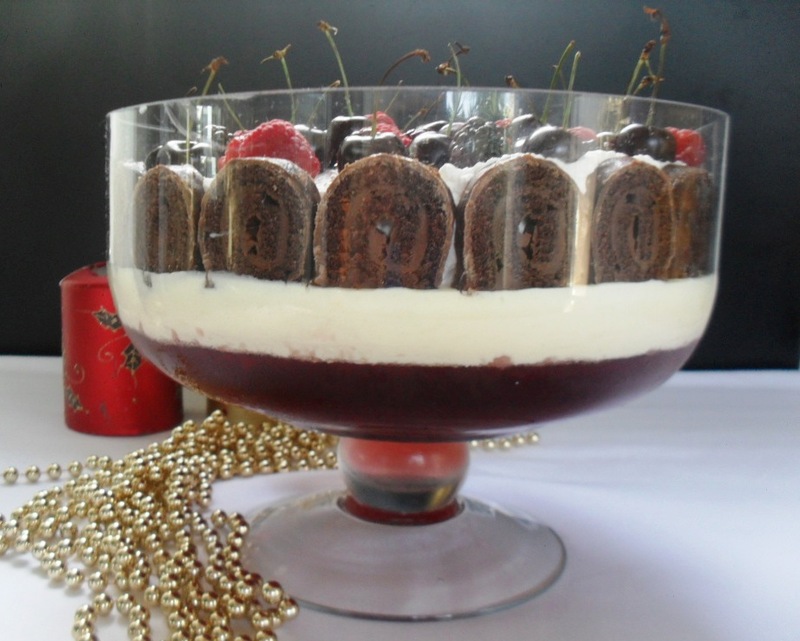 Place the sliced swissrolls on top of the chocolate mousse layer around the side of the bowl and spoon the strawberry cream in the middle. 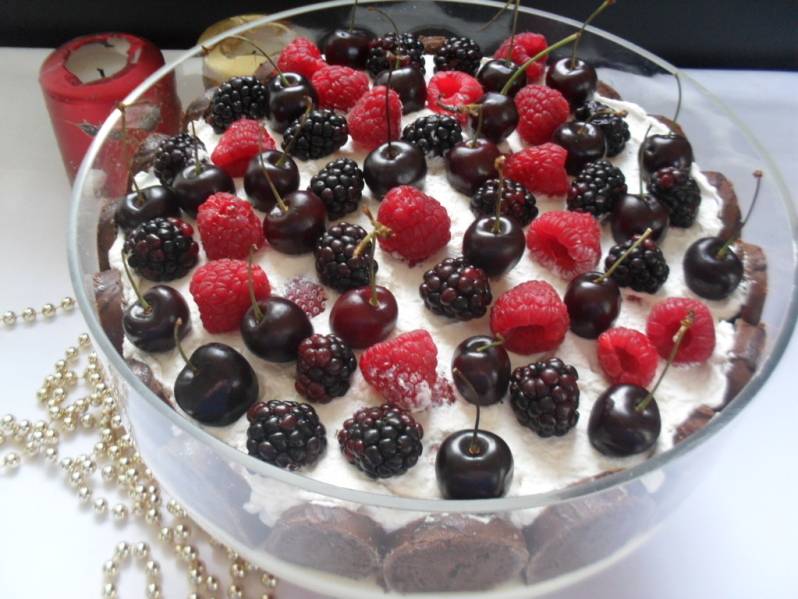 Place the mixed berries and cherries on top of the cream layer and refrigerate for another hour before serving.